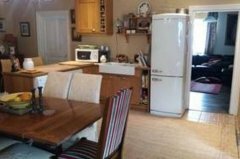 There is a very good sized kitchen as you enter which is well fitted and equipped including breakfast bar and dining area to seat eight persons. 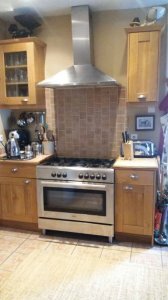 The kitchen includes a large oven/hob range, a dishwasher, microwave, fridge/freezer, washing machine, double Belfast sink and a log burner. A selection of cd's and a Bose cd / radio player. Off here is a small, cosy living room with satellite TV with both French and English channels and dvd, a good selection of dvds and books, a piano and large desk area with photocopier. Two bedrooms one twin and one double both with storage space and views of the countryside. The twin has access to the front garden via double doors. 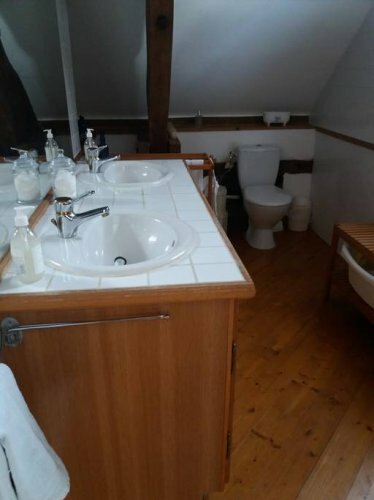 There is a downstairs shower room with walk in shower, toilet and basin. Leading also from the kitchen is a small beautiful oak wide stairs with a door to upstairs. There is a large double bedroom with sofas and a table with chairs and tea making facilities, tv with dvd only and a games console WII with games and a good seletion of DVDS and books. An area with a single bed and cot, as well as storage. There is a sofa bed for guests visiting. 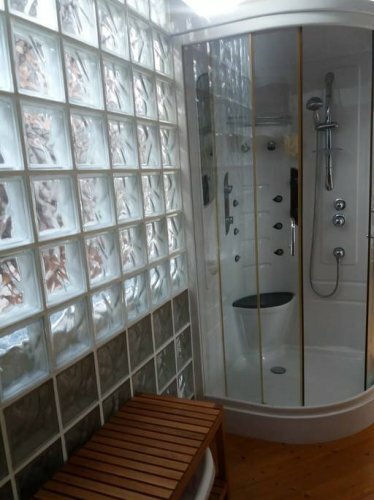 Another shower room with toilet and double basins. There are two highchairs, a travel cot and toys, games and books for all ages...babies to teens. 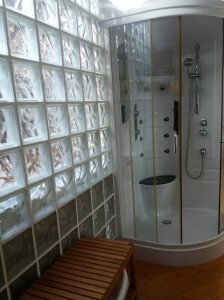 Oil fired central heating downstairs and electric wall mounted heaters upstairs. 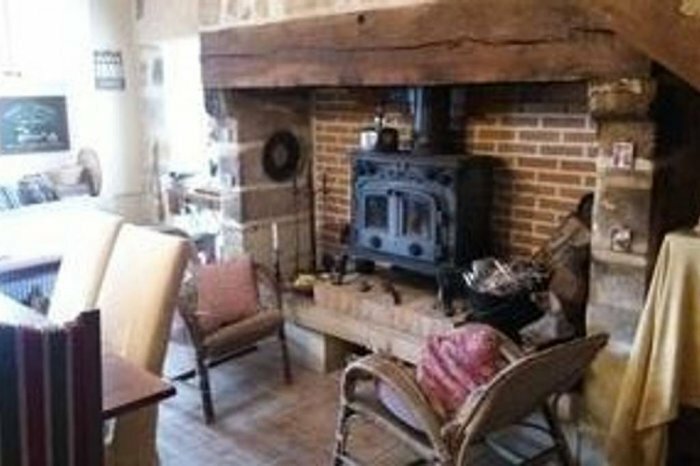 A log fire with a basket of logs supplied and then the remainder to be purchased. There is a covered laundry area outside with drier and washing lines. Outside Amenities: The house is set in 3/4 acre of flat lawned area and an area of mature trees and flowers which is visited by a gardener fortnightly with a gravel drive that can take at least four cars. This is accessed via double wooden gates from the main country road D707 Thiviers to Lanouaille. There are sun loungers and a table and chairs to seat six in the garden. There is a covered terrace off the kitchen that leads via steps down to the drive and garden. Here is another table to seat six and also two sun loungers and a new small bbq. There is another table and hairs at the front of the garden with a further two sunbeds. 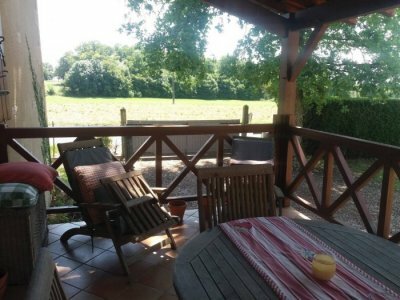 The detached property is one of three with very nice kind neighbours - both French. Surrounding Area: Chateaux, museums, art galleries and lakes with beaches close by. The nearest being a ten minute drive with cafe / restaurant and bar, park, games and picnic areas with exceptionally clean showers and toilets. During the summer months there are nightly markets, fetes and brocantes. Farmers markets selling fresh produce are in all nearby towns throughout the year. St. Sulpice D'Excideuil is our village and is a fifteen minute walk away with a small grocery shop selling a good selection local produce, alcohol, as well as fresh bread, organic products and home made pizzas to order/collect. There is a small bar, Post Office, school, church and local Mairie. Things to do nearby are canoeing, velorail, bike hire, golf, horse riding, swimming and cinema. St. Jean de Cole, Hautefort, Brantome, St. Yriex la Peche, Excideuil, Thiviers, Pompadour, Montignac and Sarlat ... to name, but a few , are all pretty villages and towns just a very short drive away with many bars, cafes and restaurants. Nearest airports are Limoges one hour twenty minutes drive north and Bergerac a similar drive South. Bordeaux just over two hours drive South West. Thiviers train station fifteen minutes drive away has connections to Nice and Paris. Ideal base for touring the area or to simply relax and enjoy the simple, idyllic laid back French country life. Central heating (oil). Log fire, electric heaters. Radio, Fire Extinguishers, Smoke alarm, new BBQ. 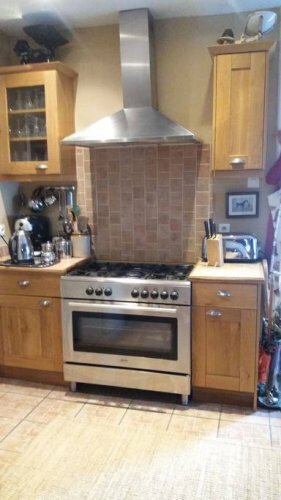 Toaster, Kettle, Coffee Machine, Blender, Food Mixer. Children welcome. But there are steps up to the house and a stairs open at the top. Smokers accepted. Not to smoke inside property. Pets may be allowed by prior agreement. We are on a main country road but with an enclosed garden. Storage and garage to be arranged if needed. Pets - 40 euros per month additional in advance. Booking deposit of one months rent, with rent to be paid one month in advance. Electricity, logs and oil additional. (Landline phone optional as an additional). The house is rented out on a weekly basis in July, August and September. Longer lets during this time can be arranged and negotiated at a different price to that shown on this site.